We Love Skiing and everything about it! When the snow falls the first thing we do here is clip into our bindings and witness Katahdin’s winter scenes as few ever see it. Bring your camera and capture the snow-covered landscape as you glide by the frozen waters of the East Branch of the Penobscot or the backcountry tote roads of Baxter State Park. The wild and varied landscape ensures that every ski trip is unique and absolutely memorable. Regardless of your experience on xc skiis, we have just the right adventure waiting for you! 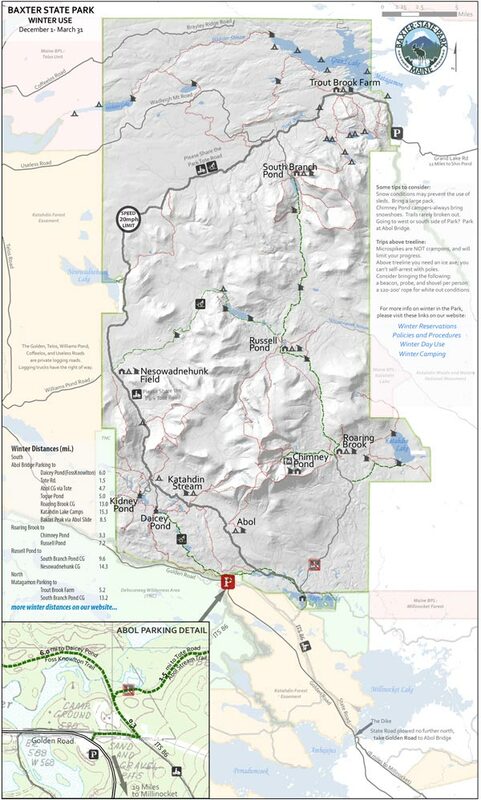 Groomed Ski Trails: Katahdin Woods and Waters Recreation Area is located about 16 miles west of Shin Pond. They have recently invested in a brand new Ginsu Groomer that is pulled behind that big yellow Skandic and boy, does it do a great job. Their trails are one of a kind and we couldn’t be more excited and enthusiastic about introducing you to them. 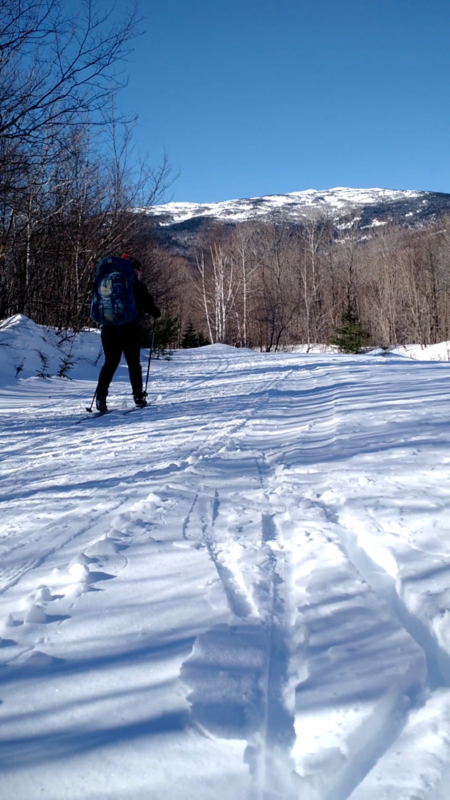 Backcountry Ski Trails: Skiing through Baxter State Park is an adventure many have dreamed about! Plan your mulit-day trip all the way through the park, or go in only for a night to South Branch Pond. 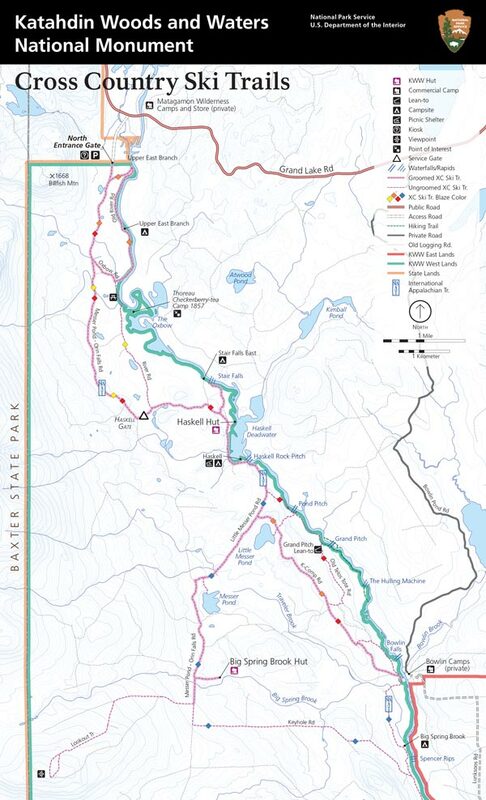 Baxter State Park Map No matter the trip, you’ll surely have a fantastic time. Let us know if you’re interested in a guide! We’re happy to accompany you to ensure a safe trip! Let us help you with your planning! We offer vehicle shuttles or transportation for ski groups planning this adventure. We’ll drop you and your gear at the northern enterance of Baxter State Park and then we’ll drive your car to the southern end so it’s there waiting for you! Follow the East Branch of the Penobscot River and explore the beautiful area that could potentially be the next National Park. There are several different options for the novice or advanced skier. Make a 3 mile loop, a 6 mile loop, or ski 10 miles down river and we’ll pick you up!